This new book explains the recent rift between America and some of her oldest European allies, especially with Germany and France. 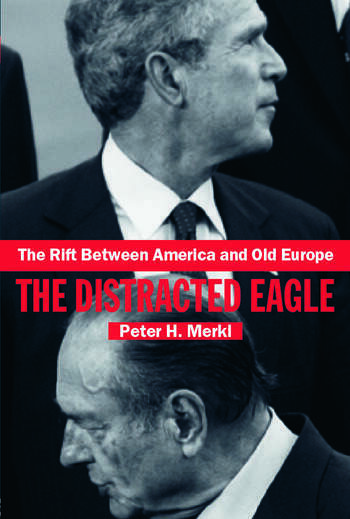 Particular attention is devoted to the several competing interpretations of the Euro-American rift, for example, that Europeans were taken aback when American neo-conservative leaders scornfully rejected their well-meant offers of post-9/11 assistance with expressions of disdain for the allies' backward military technology and budgets. The Bush administration's rejection of the Kyoto Treaty, its environmental stance and its position on international treaties are also examined in detail. Merkl's interpretation emphasizes America's neo-imperial, unilateralist posture and policies as contrasted to the Wilsonian internationalism that created the United Nations and established international rule of law backed up by the Security Council, a web of international treaties and international courts, including the International Court of Criminal Justice. Today's American leaders thus oppose European champions of an American-initiated international order while identifying themselves with the imperialist European doctrines and practices of another age. Peter H. Merkl is Professor Emeritus at the Department of Political Science, University of California. He has published widely in the field of political science, diplomacy and European Politics.